In 1988 a small circle of American Indians from the Toledo area wanted to plan a Powwow in our area. Many of the people missed being around the heritage and sacred circle of the Powwows back home on the Reservations. Joyce Mahaney, Bonnie McKenna, Connie Flores, Kim Kennedy, Dave Mistiatis and others began to plan a small gathering at Trilby Park just off of Secor Road on Shawnee. The mini-powwow was held outdoors on a Saturday afternoon in October. 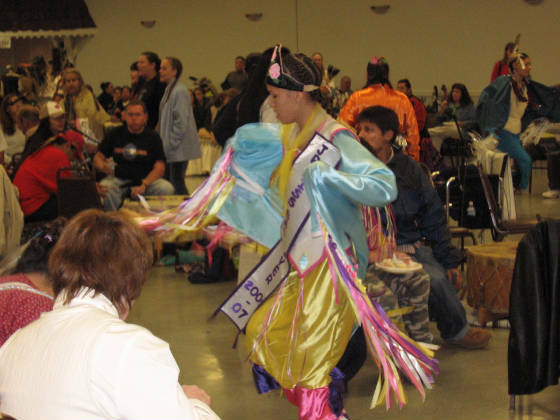 It was planned as a small event and learning experience because we were all new at sponsoring a Powwow. Singer Windy White, an Ojibwe was invited from the Columbus, Ohio area. He was also the MC. That first year there was just a handfull of dancers, eight or ten. There would have been vendors but the City of Toledo would not allow it due to restrictions. Al Smith,Ojibwe who had just moved to the area from Minnesota, gave the invocations. There were about 30 spectators and we did have a small concession stand. It was great fun for all and we immediately began planning for the next year for a full fledged two-day Powwow in 1989 ! People from the City Parks Dept., came to the first event in 1988 and allowed us to have vendors set up the following year. In 1989 we were busy planning for the event in October once again. However, the Wednesday before the weekend of the Powwow, it snowed in Toledo. Needless to say, panic set in because it was planned for outdoors. We frantically began calling for other Hall availabilty in the Toledo area in case we might have to move the event indoors. But to no avail. By Friday evening a least the snow had turned to a light rain and we planned to go on with the Powwow at the Trilby Park Shelter House. The vendors had to stay outside because the shelter house was too small. By Saturday evening the rain stopped and we were able to move the Powwow outside. That same year in 1989, Joyce met other people in the Indian communities. At the Grand Rapids, MI., Powwow she met Jay Wesaw a Potawatomi and his drum. She also had the honor of meeting Frank Bush,Potawatomi, who as a well known Elder and Veteran in the Powwow circle. Ike Peters was also at the Grand Rapids Powwow. He was an excellent food vendor and was well known for his tasty corn soup. At one of the Michigan Powwows Joyce was introduced to Sam Bush and his sister Corky. Richard Morales,Maidu of Cleveland, Ohio had heard of our Powwow and wanted to bring 50 people from the Indian community in Cleveland. That same year Joyce ran into her cousin LeRoy Malaterre at Maxine Studer's Lima, Ohio Powwow and began a friendship with Virginia Anderson who was making Fry Bread at the Columbus, Ohio Powwow. She also visited Julia Wesaw a Potawatomi Elder and her son John on the phone talking about the upcoming Toledo Powwow. Don Nelson a Potawatomi, Ray Moore and family, Chippewa and other natives from the Toledo area have participated and contributed every year since 1989 to our annual events. During the same year,Joyce called the American Indian Services in Detroit to get some information on a local Powwow and Barbara Riley,Ojibwe answered the phone. She began a lengthly conversation about who we were, what Nation we represented, etc., Joyce invited her to visit the Toledo area. Barbara Riley then introduced Joyce to Frank Shipman and Lance White, a well known MC in the Walpole Island area. He was our MC for several years. The Powwow was held at Sun Recreation Center in Milbury, Ohio in 1990-91. It has been at its current location at Summit Hall, Point Place, Ohio since 1992. Attendance has grown in both performers and audience to approximately 1,000. membership in the organization ( AIIA ) has grown to 500. All of the mentioned previously were instrumental in creating the annual Toledo Powwow and we will always be grateful for their kindness and generosity in sharing their knowledge. Some have passed away, but they are still with us in spirit at every Powwow as we continue to preserve and pass on the traditions of our ancestors to the next generation(s).